Momentary or alternate action pushbutton switches. Button returns in upper position after actuation.Main featureswith bushing Ø6.35 mm (1/4) and Ø11.9 mm(15/32). 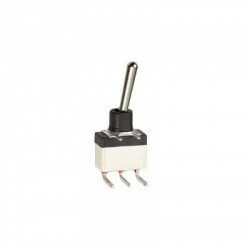 Single pole and double pole models, momentary or latching action, solder lug or PC terminals. Ratings up to 6 amps,UL option numerous plunger, bushing and accessory options. The smallest changeover switch. Main features Available with flush or raised actuator & straight or right angle PC terminals.Wave solderable. Miniature slide switches - telecom gradeMain features Single and double pole configurations, for panel or PCBWide variety of contact matérials6 actuator lengths.